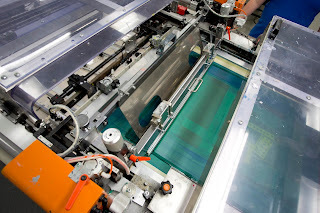 SCHURTER Blog: Why screen printing can make your product stand out? Why screen printing can make your product stand out? So, you need a visually attractive product that has strong and bold colours, and that also stands out from the crowd? You can make your product stand out if you make use of screen printing in the production of your products. Below are 3 points that show why screen printing is still number one. The consistency and reliability of screen printing equipment make them more cost-effective when facilitating a long run or complex graphic prints. The most time-consuming aspect of screen printing is the setup. This can take some time to make sure it is all positioned and printing correctly, and once the setup is complete screen printing can provide consistent high-quality prints over long runs. The way Screen printing can be used on a variety of different materials and surfaces, and that we can choose from an abundance of special inks, are all reasons that show why Screen Printing is the best method for creating products with unique features. This is a very flexible and versatile printing technology. The durability and vibrancy of screen printed parts can make a product stand out. Producing superior image resolution and more attractive colours also make screen-printed graphics much more durable and resilient than other processes. Because of this screen printing is a better option for products that come into contact with harsh environments, as well as all weather conditions. So there you have it, three quick points to why screen printing is still number one. If screen printing is the route you want to follow then please contact us at SCHURTER we will be more than happy to help. I was looking for this specific data for quite a while. Much obliged to you and good fortunes. I did a hunt regarding the matter and discovered about all people will oblige with your blog.